Amidst intense competition from around the world, the skills and talents of four of the UK’s most talented young roofers were put through their gruelling paces at the World Championship for Young Roofers final. 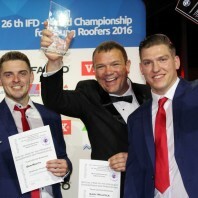 Organised by the International Federation of Roofing Contractors (IFD), the competition was staged over three days 26th – 28th October 2016 and took place in Warsaw, Poland. The task to win a medal at this leading event is by no means easy. However, the UK duo competing in the waterproofing roofing category beat off contenders from all corners of the globe to win one of the prestigious President’s Prizes for Innovation that are awarded for each category covering pitched, waterproofing and metal roofing. This was a voluntary task that allowed competitors to use their own creativity and initiative utilising a range of roofing products. Congratulations go to Jordan Lane of Lane Roofing Ltd (Birmingham) and Ben Revitt of Briggs Amasco (Birmingham). Team GB for pitched roofing – represented by Connor Martin of Fineline Roofing Ltd (Devon) and Donal Harkin of D Harkin & Co Limited (Northern Ireland) – also put on an impressive display of roofing skills and were extremely unlucky to miss out on medals on this occasion. Livia adds: “Regardless of medals, our four young roofers are all winners, and we would like to take this opportunity to thank them for their time, effort and extraordinary skill. The honour of reaching this highly-charged final and representing our country is achievement in itself. In addition to the President’s Prize for Innovation, all participants have taken home a commemorative present from the host country and a certificate of participation from the IFD. “NFRC is also grateful to the teams’ employers, mentors and sponsors without whom the extensive training that is required when competing at this level would not have been possible,” concludes Livia. of their work, the exploitation of material, technical skill and realisation of the requested work. Sponsors of this year’s World Championship for Young Roofers were as follows: Briggs Amasco Ltd, Cupa Pizarras S.A, D Harkin & Co (Roofing) Limited, the Institute of Roofing, Liquid Roofing and Waterproofing Association, Monier Redland Limited, Single Ply Roofing Association and Sika Limited.